JP 2014-01-29 ¥1,200 ×3 ? 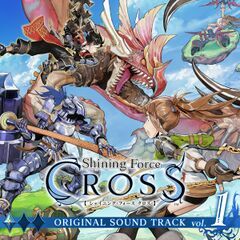 Shining Force Cross Original Sound Track is a digital album that contains music from Shining Force Cross. It was released in three volumes in January 2014 in Japan on iTunes and Amazon. Individual tracks cost ¥150 each. Some tracks on the album were previously featured on the Shining Force Cross Raid Original Sound Track.